Israeli rock guitarist Berry Sakharof performs at the Har Hevron Regional Council despite boycott calls. 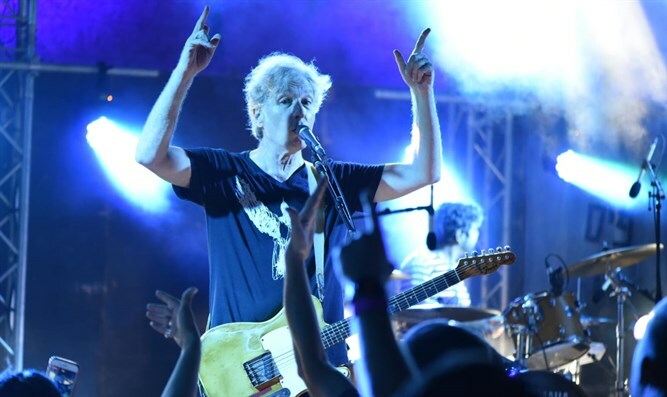 Israeli rock guitarist, songwriter and singer Berry Sakharof, one of Israel’s most popular musicians, performed on Thursday evening at the Har Hevron Regional Council. The concert was attended by hundreds of local residents. The show took place despite protests by extreme leftist organizations demanding that Sakharof refuse to hold concerts beyond the Green Line. Sakharof performed his most popular songs and received a warm embrace from the residents. "We congratulate Berry Sakharof for his successful performance in Har Hevron, part of a long series of performances by Israel’s finest artists, who came this summer to make the residents happy," said Yochai Dimri, head of the Har Hevron Regional Council. "We call upon all the artists of Israel to continue to come and perform in Har Hevron, one of the most beautiful places in the State of Israel, which has been blessed with excellent residents, both secular and religious, a mosaic of Israeli society. We'll continue to make good music which unites people,” he added.